Last week I had the privilege to sit down with Jason Collingwood, internationally acclaimed rug weaver, for an interesting conversation, covering several topics. This, the first of two parts, focuses on Jason’s experience as a rug weaver and a teacher of rug weaving. The second part, in my next post, focuses on Jason’s views of what it takes to become a successful artisan. 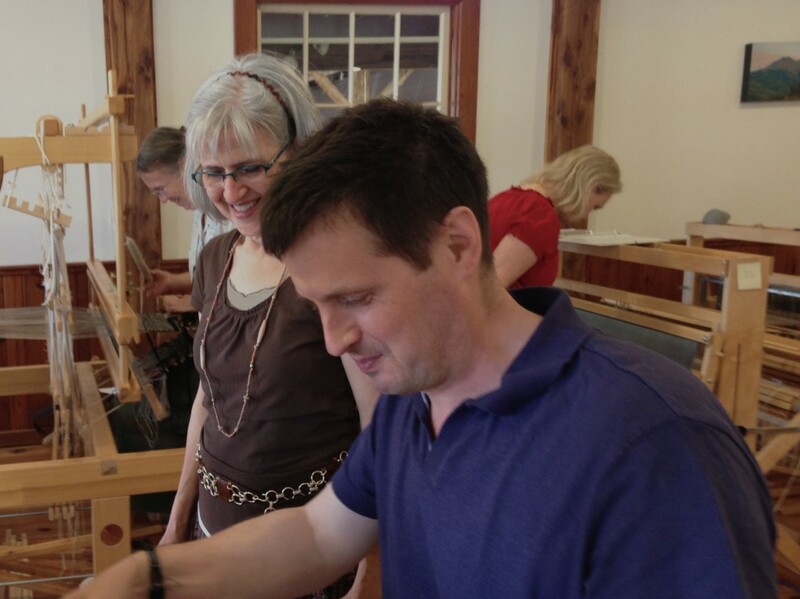 Jason Collingwood, at my little loom, demonstrates a selvedge technique used for plain weave rugs. I am watching every move. Me: Your father, Peter Collingwood, wrote the comprehensive book, The Techniques of Rug Weaving. Just how important is technical skill for creating handwoven rugs? Jason: I’m passionate about technical competence. That is number one, because if you don’t get that part right, what you are producing is not going to be satisfactory. Me: Is it possible to look at a rug and tell if it was woven with technical competence? Jason: One of the defining parts of a good rug is the selvedge. Always check out people’s selvedges. If they’ve got a neat selvedge, then it’s a sign of a good rug weaver. Me: What is it that sets you apart from other rug weavers? Me: You have excelled in producing high quality handwoven rugs, even though few people have been able to do that. How do you account for your success? Jason: I think what possibly sets me apart is that I’ve just done this one thing for twenty-six years now. Most weavers, be they rug weavers, or other, probably have other strings to their bow, and do other things. By just concentrating on one thing, your name perhaps becomes associated with that product, and that helps you in the long run. Me: Have you considered weaving other items besides rugs–like scarves, for instance? Jason: I don’t think there’d be any benefit for me, suddenly trying to weave scarves, and sell scarves. I don’t think I’d be adding anything to the world of weaving scarves. Me: You teach in your studio in England; and you travel around the world teaching rug weaving. Is there any piece of advice that you want your students to grasp? Jason: One overlooked bit of advice is that you have to accept that the technique that we’re weaving in, and the looms that we’re using, place limitations upon you. You need to work within those limitations. Do not try to make the loom or technique do things that it doesn’t want to do. I think too many people have preconceived ideas of what they want to produce from a workshop; and then they try and make the structure achieve these ideas. Sometimes it just technically doesn’t produce the design they want, and they get frustrated. Me: How can a student get the best results, then? Jason: I think you need to understand the structure, and work in harmony with the structure. And then you will be much happier with your finished product, because you are not fighting the structure. Please visit Jason Collingwood’s website to see the beautiful rugs he creates and sells, and descriptions of the classes he teaches. I was fortunate to take Jason’s Plain Weave workshop last week at Homestead Fiber Crafts in Waco, Texas, where my little Glimåkra Ideal had her maiden voyage. It was an excellent class that I would recommend to anyone interested in learning basic rug weaving techniques. May you find your one thing, and grow in expertise. I have taken 2 classes with Jason. He covers a lot of material in his classes. One finishing technique he covered was a method to finishe without fringes. I believe he had a red sample. I am trying to use this technique but cannot remember how to do it nor can I find it in my notes. Is there someone that can explain the technique? I do remember seeing Jason demonstrate a few finishing techniques. I’m not positive which one you are referring to, but I will go take a look in my notes from the workshop and see if I find something that answers your question. In the meantime, I have a short video on tapestry edging that is very similar to one of the edgings that Jason described. Besides the “braided” edge that I show in my video, Jason also showed us how to weave each of the ends back into the rug using a sacking needle.